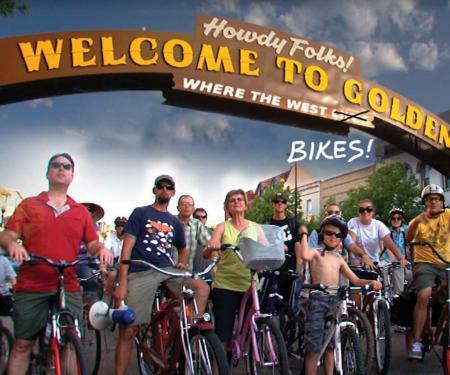 Golden, Colorado is where the Great Plains meet the Rocky Mountains, and because of its spectacular location, Golden has become one of the most popular biking capitals of Colorado. 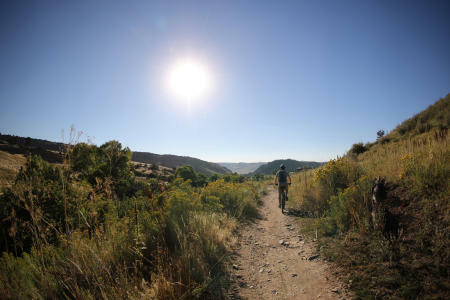 Here you can find all types of biking trails in Golden. You can pedal for more than twenty miles along the Clear Creek Trail following the route taken by gold seekers 150 years ago, or you can gear down and try to pedal up one of Colorado’s most iconic hill climbs – the twisting road to the top of Lookout Mountain. Best of all, after your ride, there are five craft breweries in historic downtown Golden offering the perfect place for a victory beer, and plenty of fuel stops to rebuild energy. Here are some prime Golden biking trails. Featured in the U.S. Pro Challenge, this is one of the most famous hill climbs on the Front Range. The paved road snakes, twists and turns, climbing 1,300-feet in 4.3 miles, from historic downtown Golden to the 7,379-foot summit of Lookout Mountain. The scenic road was designed by Frederick Law Olmsted, Jr., the son of the famed landscape architect who created Central Park in New York. 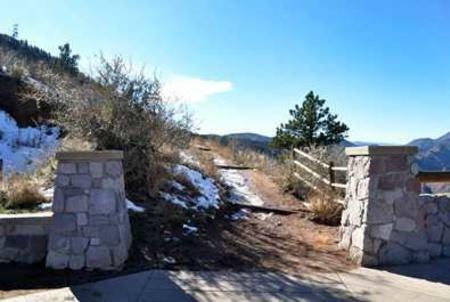 It was built in 1914 as part of the Lariat Loop Trail, a series of early scenic paved roads that connected the famed Denver Mountain Park system. Today, there are far more cyclists than cars. While it is a challenging climb with 5-6 percent grades, bikers are rewarded with incredible views of Golden, the foothills and the far off snowcapped peaks. At the top, stop at Buffalo Bill’s Museum and Grave for a historical tour, or at least a cold drink in the museum’s snack bar and gift shop. Cyclists can zoom back down the mountain, or continue on a 15.5 mile loop trip, which includes views of a genuine buffalo herd. Fuel Stop: Located downtown, D’Deli (named after the Dutch pronunciation of The Deli) is a Golden institution and routinely wins “best of” awards from all local media for its amazing sandwiches, which include unique Colorado subs made of cold cut elk and cold corned buffalo. 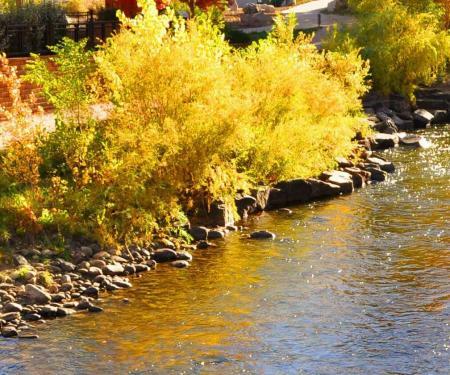 One of the favorite paved bike paths in metro Denver, this trail begins in Clear Creek Canyon and meanders down alongside the river for 19 miles on a slow downward grade to the South Platte River, where it joins another 40-mile paved bike trail, opening up a myriad of possibilities. The path is tree-lined for nearly its entire route, and seldom far from the pleasant sound of rushing water. The big gold strikes of Central City and Black Hawk were discovered along Clear Creek up in the mountains, and today with the price of gold so high, many weekend prospectors can be seen along the bike path trying their hand at gold panning. Along the way, the trail passes Coors Brewery, the largest single brewing site in the world, and comes near the Colorado Railroad Museum, the largest collection of trains in the Rocky Mountains. On Saturdays where there is a “steam up,” you can hear the train whistles echoing off the surrounding buttes as you pedal along. Fuel Stop: Located near the bike path is Miners Saloon, a modern day saloon reminiscent of Golden’s mining days in the late 1800s. The food menu features shared platters, small plates, paninis, soups, salads and desserts, along with a few modern takes on old saloon fare. The unofficial “bike highway” to Golden is the straightest shot between Denver and Golden and literally passes under Coors Brewery in a tunnel and through Highland Square at 32nd and Lowell, one of Denver’s hippest neighborhoods. The on-street trail has no official designation, and frequently mixes cars and bikes together. But, it’s the quickest way between the first and second capitals of Colorado and is a favorite of local cyclists, who often ride an epic 37-mile ride from Confluence Park in Denver to the top of Lookout Mountain and back using this route. Less challenging is to ride from Denver to Golden on Clear Creek, and return by this quicker route. Fuel Stop: The Sherpa House & Cultural Center in historic downtown Golden is unique, providing a wonderful blend of authentic Himalayan cuisine and culture. Try the Sherpa Stew, a mixture of vegetables, dumplings and spices combined with your choice of beef, lamb or yak meat. They also have lighter dishes and salads, all served in a re-creation of a house from Nepal. In summer, don’t miss their wonderful outdoor dining area. Ask for a Sherpa Beer. Brewed in Nepal, the beer was created and is partially owned by their local neighbor, Golden City Brewery. Lava flows 60 million years ago created North Table Mountain (and its nearby sister, South Table Mountain). Today, there are 15 miles of hiking and mountain biking trails around, up and over the mesa, which supports a herd of 100 mule deer as well as eagles and other wildlife. A popular mountain biking route is the 7.4 mile loop that goes completely around the mesa, some of it on rolling single track. There are other routes that go to various viewpoints on top of the mesa and to an old quarry. Lock up the bikes and climb on the hiker only trail to the 6,652-foot summit of Lichen Peak. The parking area north of downtown Golden on Hwy. 93 has maps and trail guides. Fuel Stop: The Table Mountain Grill & Cantina in historic downtown Golden has beautiful Santa Fe décor, with a flower-covered outdoor deck overlooking South Table Mountain. Try the chicken tortilla soup, their famed breakfast burrito, or a buffalo burger with sweet potato fries. They also have an extensive list of local microbrews. Ute and Arapaho Native Americans once camped and hunted on this land. In 1865, James and Mary Bond built a homestead and farm here. They were bound for California, but settled on this land after their young son was accidently killed under the wheels of their wagon. Their house still stands on the park grounds. There are 18 miles of multi-use trails offering a variety of biking trails with mountain and homestead views. 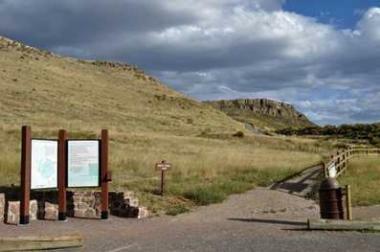 The 4,300-acre park is located 2.7 miles from downtown Golden. Fuel Stop: You can see White Ranch in the distance from the wonderful outdoor patio of the Bridgewater Grill. The patio is located along the banks of Clear Creek and offers a Colorado menu of High Plains buffalo short ribs, Rosa’s Green Chili, Colorado raised beef tenderloin, Smoked Colorado Trout Dip and Wild Game meatloaf. Or build up your calories for the ride back with homemade Peach Cobbler or Triple Chocolate Mouse Cake.